Here it is. To prove there wasn’t going to be a sequel series. To keep from their being people asking for Angel Beats 2 where Otonashi is pining for and working to move on and be with Kanade. In a strange way, it fits, a loud announcement that “This is it.” Instead of leaving the possibility of there being a sequel, he flashforwards to when the two are reunited. If he’d flashforwarded, and the two didn’t reunite, once again the possibility for a sequel would be opened up. By doing this, he slams the door shut again. Looking back at the series and its presentation as a complete work is interesting. There’s a lot of love and passion that goes into, but at the same time, there’s anger. The series and plot is overstuffed, and seems to act as a teaser of what could have been more then an actual story. The moves done here in the story execution are so poorly done that only amateurs would make these mistakes. I think Jun Madea did it on purpose, to give us a taste of what he could have done if he’d been given the length that he wanted to tell the story rather then stuck with half of that. He wants to demonstrate that he should be given longer series to create then 13 episodes, and to be stuck with only 13 episodes to tell his story made him angry. The target of his anger was the storytelling. Jun was going to leave us with a “What could have been” and hopefully get the length he wanted for “Little Busters”, not settle with 13 episodes. Of course, this is all a guess. We’ll see what exactly does happen with “Little Busters”. Also, I’ll keep hoping “Angel Beats” will get told in a better format, be it manga, visual novel, or however it should happen. Little Busters! would never work with 13episodes anyhow. There’s simply too much info to get across in that short a span… seeing as it’s about the first Key works that really does combine all its arcs into one story. I can’t really see Maeda’s “anger” in this, frustration maybe but… anger would be very, unprofessional. But nevertheless, I do agree AB’s ending is quite conclusive in its own way. That’s why I blog. Maybe someone in Japan will see that my ideas are so much cooler than theirs and they’ll hire me. No. I’m not delusional in the least. There’s a lot of anger in Angel Beats (Mainly projected through Yuki), and I rather liked that anger. It gave the series some bite that kept me interested for the most part and I wished that the series followed through with it. I’m not familiar enough with the dude behind the story, since I liked what I saw of his other series even less than I liked Angel Beats, so I can’t comment on whether it’s something personal he’s inserting into the story or not. I guess that’d make as much sense as anything else, though. It’s kinda like some of the reviews I’ve read about Inception and how some people read it as Christopher Nolan venting frustration with how his producers (One of whom is his wife) have put a stranglehold on his creativity, hence why DiCapprio’s wife haunts him inside dreams and refuses to allow him to be a dream architect anymore. Except the “sabotate” being illustrated in Angel Beats is on more of a metatextual level. To be blunt, as much as I liked Angel Beats, I don’t think he’s the most professional guy. Interesting thoughts. While I liked Angel Beats! very much as a whole, I did think the ending was a bit abrupt, and one of my general complaints is indeed that it should have been a longer series considering its large cast of characters, most of whom got little individual attention. I’m really hoping for a 26-episode KyoAni remake some time in the future, but I shouldn’t hold my breath. That’s a really interesting take on the last scene. Jun Maede may have thrown it in there to indicate what could have been done with more space. I took as a nice wrap up to a series that tries to do too much. It gave the ending adequate space unlike everything else about this series. The last scene was open enough to get fans hoping for another series, but also definitive enough that the series felt finished even if there is no more sequel. Hehehe, well maybe I just over think these things. I dont think there is going to be a sequel but a prequel instead. A prequel is impossible. The character’s life stories were all pretty much explained in this season. A sequel is not needed either. In the original ending, Otonashi and Kanade are together in the next life. If there were to be a sequel, it would have to follow the alternative epilogue, where Otonashi does not disappear, and he becomes the principal of the school, guiding the students as they come and go. could of been something other then just a bunch of Computers in one room.. or so i see. But it would of been better if Angel Player was harder to destroy than just simply shoot all the computers down. If Angel Player was created by an individual to go against god wouldnt it be somewhat Godlike? cuz to me lol it was the Final Boss its almost as if u used cheats and killed the boss in one go. But this is just my opinion so… dont take it personally lol. but i didnt rlly get a good description of Angel Player..i only kno the simple facts. so someone correct me if im wrong. I think (I still don’t know their names LOL, except a few, like hinata, kanade, and yuri(ppe) the main character did move on, because he mentioned how he just wanted to be thanked, and it happened in the end. I watched the whole thing in a matter of hours, I might actually give clannad another chance. In the last scene of ep 13, before the credits, you see a star rising to the sky from where Otonashi was, signalling his passing. I finally finished Angel Beats after a year hiatus. The anime as a whole was great. The ending was quite abrupt leaving a lot to think about. The way the anime portrayed fiction from reality, the last scene could have been just that. They implied Otonashi and Kanade had successfully vanished from that world. This could have been a whole string of episodes to accomplish that. You could easily tell after EP. 13, they wanted to portray the story in 26 episodes rather than 13 but had to squeeze something out. If you were part of the Angel Beats staff, imagine how you would finish the series. Since 2010, with their initial success and recently polled in Japan (Feb 2012) to be the most deserving of a sequel, I see an imminent addition to the series. I have a strong feeling they will try to bring back someone from the original. I’m sure this time around, they won’t pan out to tons of side characters and allow their recurring mains to flourish. 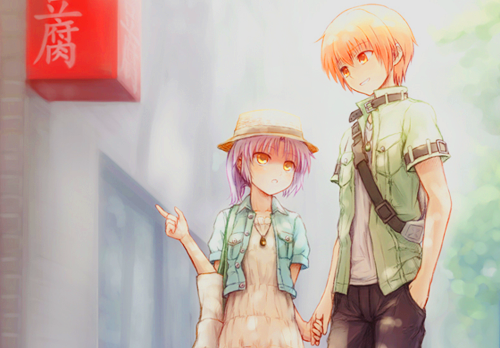 I really love “Angel Beats!” even if it’s only 13 episodes Anime. Time in the after life isn’t linear and doesn’t follow events in the order they happen in our timeline. We can only guess by putting together the pieces we are given. Someone might be able to help me here. 5. Otanashi has strong amnesia only cured by Kanade’s/his own heartbeat. Conclusions: This suggests that Otanashi is placed in the purgatory-realm as a mechanism for Kanade to find peace and leave. He’s a key, if you would. She must thank him in order to move on, therefore he must be there in order to be thanked. He would not exist in purgatory unless there is that reason. He could have been brought – from wherever his soul existed after death – to purgatory in order to be thanked by Kanade. This is a potential explanation for the inverse relationship between the real life death timeline and order of arrival in purgatory. We can also make a few assumptions to get off easy, but they are only assumptions. None of the below is confirmed by dialogue or visuals. 1. One does not immediately enter purgatory upon death. There may be lag time. This could explain how Kanade could have arrived first. This might be far fetched, but it is how I rationalized the confusion of Kanade existing in purgatory before Otanashi.